Laona is known to many for its Lumberjack Steam Train, but did you also know they have the World’s Largest Soup Kettle? 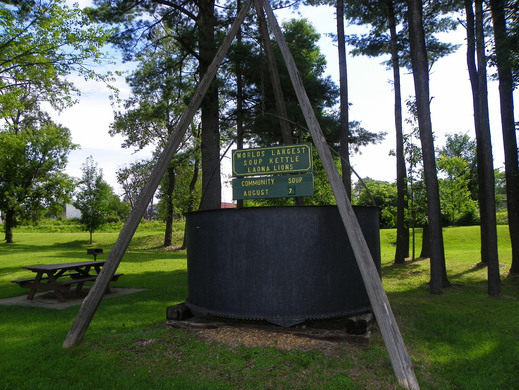 This tiny burg in Forest County where U.S. 8 and Highway 32 features this large gray pot, dangling by a tripod wood supports in a town park. The kettle has a seven-foot circumference and is three feet deep. One day each August, the Laona Lions Club hosts Community Soup Day, with free soup that used to be – but no longer is – made in the kettle. That stems from a tradition dating back to the 1920s; today it continues… just bring your own bowl if you plan on attending! Information on Laona’s Community Soup Day can be found here.